In response to these pain points, Senturus developed two system evaluation programs to identify the source of these problems so you can mitigate these common issues and improve your overall analytics environment. The BI Architecture Assessment program provides a comprehensive review of your entire BI architecture, on-premise and cloud. We do an A to Z assessment of the performance-critical areas impacting your analytics environment, including data preparation layers and analytics tools. We grade each area against industry best practices, highlighting where your analytics environment stands in comparison. We then share concrete findings along with a recommended roadmap for each architecture component, prioritized to provide quick wins related to improving your analytics platform. 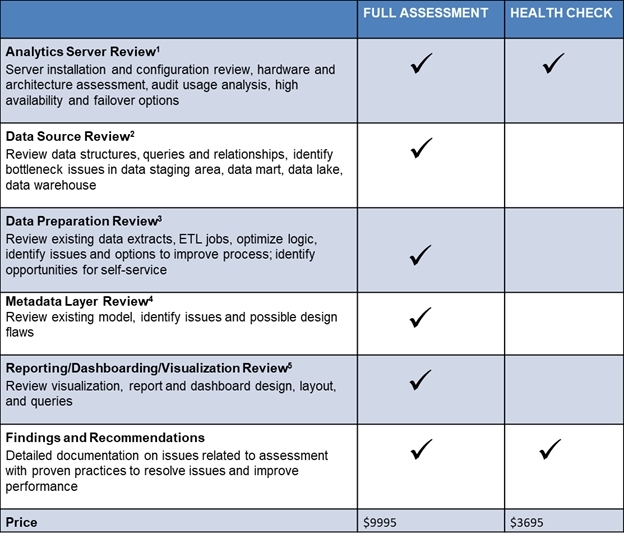 With this evaluation, we focus primarily on the state of your analytics environment. Similar to the benefits of routine car maintenance, our health check helps identify potential trouble spots before they become bigger issues (not to mention more complicated and expensive ones). Performing a health check on your analytics environment will help keep things running smoothly and will minimize down time for your end users. 1 – Limited to a total of three servers of various configurations; 2 – Limited to one subject area and five routines; 3 – Limited to one subject area; 4 – Limited to one model; 5 – Limited to three reports/dashboards (reports not to exceed three pages). If you’re not sure which program is best suited for your needs, we offer a complimentary one-hour phone consultation to help get you on the right path. Ethical behavior and a customer-centric approach to business comes first with us. That’s why both programs are risk-free and fully guaranteed. If we don’t provide you with information that reveals a significant insight on how to improve your business analytics environment, we offer a money back guarantee. For more information on our programs or to schedule a complimentary one-hour consultation, fill in the form to request a call. Or you can contact us directly at 1 888 601 6010 or info@senturus.com. I was very satisfied with the written documentation’s contents and was also more impressed with the instructor’s professionalism, care, and effort in the training.